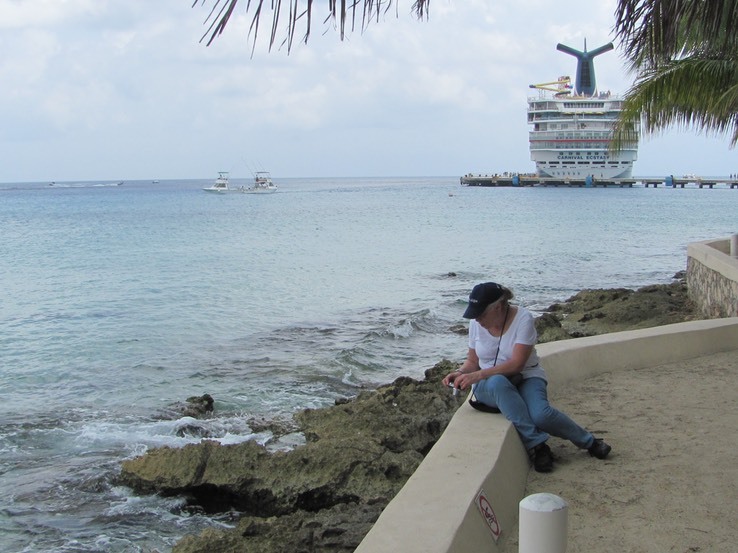 Cozumel was our first port on this cruise. The area around the port seems to be largely a construct of Carnival Cruise Lines. That is not all bad, because the area is kept up nicely and the merchants don’t hassle you as much as they do outside the port area. The focus on tourists is total near the port. There are bicycle taxis that apparently are there to take you from the ship to the duty-free store. Once outside the immediate port area there are taxis, horse-drawn carriage rides (expensive) and more merchants. There were three Carnival cruise ships in port the day of our visit. 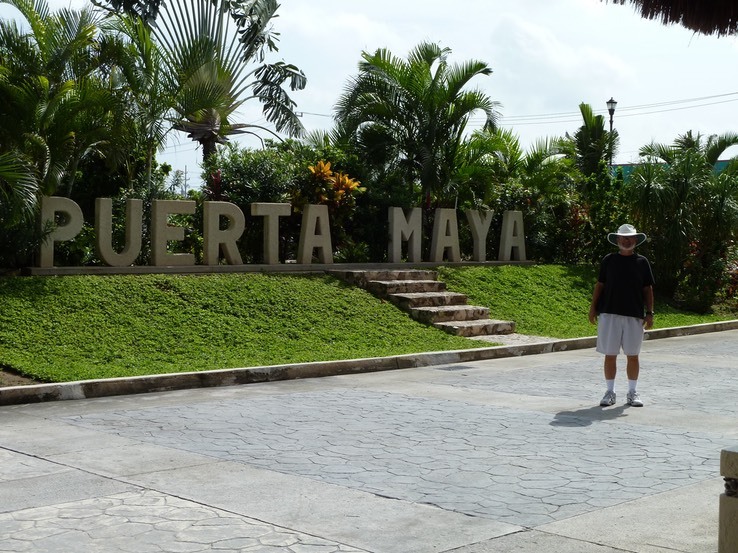 We decided to try walking to town, but between the heat and a high pressure salesman for what is probably a time share resort, we decided to head back toward the ship. On the walk back to the dock area we encountered this iguana on the sidewalk. He didn’t seem to mind having us close to him. We had a certificate good for a snack plate at Pancho’s Back Yard Restaurant, which we were able to use because we accidentally found the restaurant. We had a light lunch with beer; our time there was made pleasant by a couple of locals playing a marimba. The food was excellent. After we had finished eating, someone spotted several more iguanas hanging around. The green one is apparently a young one. There is a coral reef exhibit nearby, and after looking at it, we discovered tide pools just over a low wall. There was plenty of life to be seen in the pools, including some tiny fish, many kinds of snails, sea urchins, and chitons, a survivor from pre-historic times. While we were exploring the tide pools we met a very nice couple from Lafayette, Louisiana, who was on one of the other ships in port. That added yet another very pleasant note to our day. There are additional photos here.